Deciding when to visit Gatlinburg, Tennessee, is all about your vacation preference. Are you wanting to venture through a trove of spring wildflowers or soak up the summer sun by the pool? Perhaps you’d prefer to view the colorful autumn leaves across the Great Smoky Mountains or cuddle with your sweetheart by a toasty cabin fireplace. No matter the season or the reason, the best time to visit Gatlinburg is up to YOU! In addition to local attractions scattered about Gatlinburg and nearby Pigeon Forge, fun events fill the calendar throughout the year, so there’s always plenty to do. Check out our top seasonal experiences and plan your Gatlinburg visit with family and friends today! Mwah! Smooching, hand-holding, constant hugging, gift-giving — Valentine’s Day will be here before you know it! 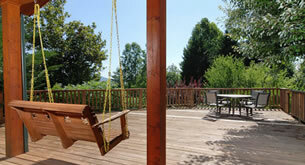 And what better place to whisk your loved one away than the Great Smoky Mountains? A place where romance abounds, and love fills the air, you can bet your bottom dollar you’ll have the most memorable time with your sweetheart in the Smokies. From a private cabin stay with thoughtful additions to the most romantic spots in Pigeon Forge and Gatlinburg, make this Valentine’s Day one to remember! Thankful for Gatlinburg — a Special Place in the Smokies & Our Hearts! Only one month away…Thanksgiving will soon be here! Can you believe it?! Gearing up and getting into the holiday spirit, we’ve dug deep to discover what we love most in Gatlinburg, Tennessee. While the obvious may hit the forefront, such as fun attractions, high-end restaurants, and quaint country shops, we’re thankful for so much more: the top entrance to the national park, Christmas year-round, choice cabins, the friendly locals, handcrafted keepsakes, and unforgettable memories. Rolling blue hills, lush green trees, vivid wildflowers, blooming shrubs, bright blue skies, a variety of wildlife – it’s no wonder that so many couples come to the Great Smoky Mountains to say “I do.” Pair all those fantastic outdoor perks with the amenities and conveniences of the City of Gatlinburg – all-inclusive wedding chapels to meet any need, wedding dress shops, great restaurants, and more – and you have an ideal destination for a beautiful summer wedding. On November 28, 2016, 1 year ago today, one of the most dangerous fires in Tennessee history swept through the Gatlinburg area, claiming 14 precious lives and destroying more than 2,000 businesses and homes. Bred from a complex of fires, the largest of which began atop Chimney Tops 2 (a peak in the Great Smoky Mountains National Park), efforts were made to both contain and douse the fire, but the relentless 40-mile-per-hour winds proved too great, spreading the fire across natural boundaries and towards the city of Gatlinburg. Where the 2016 Gatlinburg Fires took so much and left very little, the people of Gatlinburg have proved strong, continuing to rebuild, restore, and recover from this devastating event. They’re staying #GatlinburgStrong. To continue growing as a company and sharpening our expertise for our guests, we sent members of our Cabins for YOU team to take part in the 2017 VRHP (Vacation Rental Housekeeping Professionals) National Conference joined by VRM (Vacation Rental Management) Intel in Gatlinburg, Tennessee. While attending various sessions over the 3-day conference was indeed enlightening, nothing was more pleasing than receiving the outstanding news that our very own Brandi Herbstritt, a truly caring and devoted employee, had been selected as the 2017 VRHP Housekeeping Executive of the Year! The Smokies is well-known for its exciting modern attractions like Dollywood and Ripley’s Aquarium, but did you know they’re also steeped in rich history and authentic mountain culture? In the Smoky Mountains, you can still find a number of craftsmen who stay true to their roots, making Smoky Mountain art the old-fashioned way—including Gatlinburg woodworkers.